52 entries categorized "Geek of the Internet"
I mentioned almost two months ago now that my Hindi movie blog Filmi Geek was a highlighted as a "Featured Blog" by my bloghost Typepad. Now it has also been featured here, in Typepad's German version of the "Featured Blogs" blog. Bollywood cinema - who thinks there only of heart pain strips for hours and handpainted film posters, is exactly correct with Carla Levy: in its English-language Blog Filmi Geek shows it, what hides itself still in such a way everything behind this term. Films for Bollywood Einsteiger, classical authors and English-language productions are presented; five decades Hindi film, crime film classical author such as Don, Arthouse trips such as park Avenue and films from other regions such as Ghare Baire pass revue. Listings after star and alphabet round Filmi Geek off to the purposeful search. This is quite nice. I particularly like the phrase "Arthouse trips." There seem to be quite a few Bollywood fans in Germany - I have discovered an entire webring of German language Bollywood blogs (does anyone still use the term "webring"? It sounds so 1999 to me and evokes memories of flagrant abuse of the HTML 1.0 "flash" tag), and I am lucky to count many of their authors among Filmi Geek's readership. Thanks to having been a Typepad Featured Blog, as well as being linked on a number of other wonderful blogs, my new Filmi Geek blog is already getting about 120 visits each day. I think it's quite neat - and it shows, also, that a single-interest blog is more likely to attract readers than a general interest blog. So I thank those of you that read this blog, even though it isn't really about anything in particular. (Click the image for a larger view.) That's a real map of Filmi Geek's visitors from a couple of days ago. I think it's interesting that so many of visitors are from the eastern United States. But there's a fun worldwide distribution. Most of my visitors come from North America. and Europe, but each day I have a hit or two from China, a handful from Australia, occasional visitors from Indonesia, Malaysia, or Singapore, and a couple from South America. 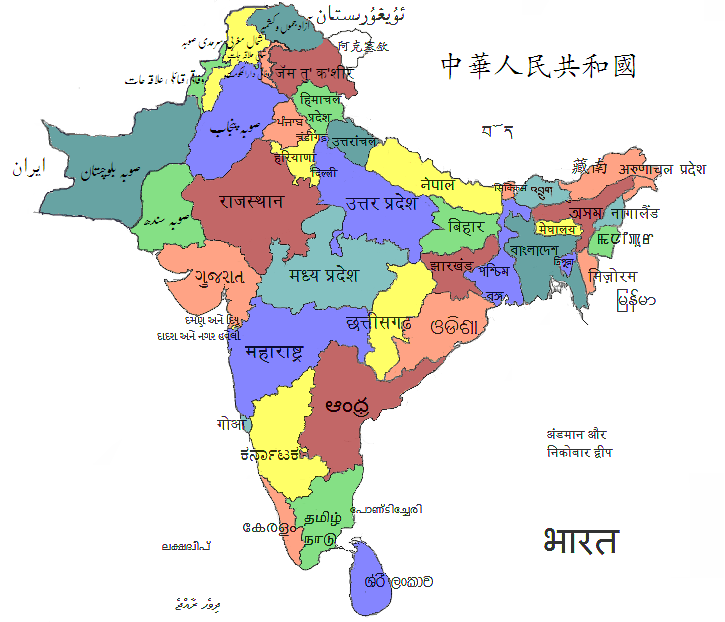 And then there are those visitors from South Asia, of whom I am particularly proud. You can see the most recent map by clicking here. I think it updates once a day, a little after midnight my time (Eastern time). It's been a big 24 hours for me. Yesterday, I met Shabana Azmi. Today, my other blog, Filmi Geek, is a TypePad Featured Blog. I will have more to say about that first bit later. 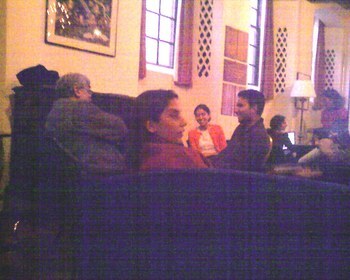 For now, here's a bad, grainy, stalker-ish picture I snapped with my camera phone a couple of minutes after I met Shabana ji, while she was talking with someone else. The gray-haired fellow to the left is Shabana ji's equally revered and gifted husband, the screenwriter and songwriter Javed Akhtar. 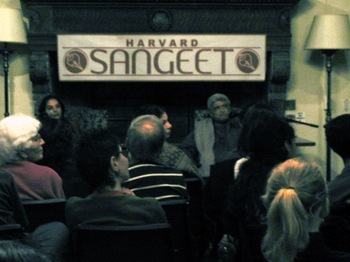 And here's another one (again, bad light, bad color), taken about an hour later while Shabana ji and Javed sahib were taking questions from the largely student crowd. I don't know who the bald-headed guy in the middle of my shot is, but the woman whose face appears to be poking out of the upper-right quadrant of his head is my wonderful former Hindi teacher Naseem ji, who did me the honor of introducing me to Shabana ji at a moment when I was too flabbergasted and sweaty-palmed to do it myself. As I said, more details to follow. After mentioning that I was thinking of reorganzing the Geek Indian film list, I have decided what to do with them - I have created a new blog, Filmi Geek, which from now on will be the home for all my comments and reviews on Indian movies. I'm hoping it will be an interesting and fun resource for folks interested in Hindi films, seasoned fans and neophytes alike. I have only begun migrating all of the existing reviews and comments to the new blog, (thus far contained in the Geek Indian film lists parts I, II, III, and IV) so expect the Filmi Geek archives to grow quickly over the next month or two. After that, I'll add a new movie every week or two, as fast as I can watch them. Oh, and there are already a couple of new entries there for films that were slated for part V of the Geek list. So please check it out and let me know what you think. There's an alphabetical index and also categories from which you can select types of films you might be interested in, get a quick look at my favorites, or browse the films I recommend to folks who are looking for a good introduction to the diverse and colorful offerings of Hindi cinema. I'm spinning Filmi Geek off of Geek of All Trades in order to preserve the eclectic balance of GOAT and avoid giving too much attention to any one area, and also to provide a focused space for Hindi film fans who might be less interested in all my other blather. But I won't stop talking about Hindi films here at GOAT - I just won't do it as much. And I hope you'll all stop in to both sites from time to time. I'm always interested in your comments on my comments, and your suggestions for more and more useful categories. In my visitor logs, I noticed that I had gotten a number of hits from people searching Google for "goat indian movie list." At first I thought that was cool - someone out there was looking for me by name. Then I took a look at what that search actually called up, and, well, let's just say that there is something out there called "goat list" that is not exactly something I want associated with my happy little blog. So I've changed the names of the lists, to "Geek's Indian Film Lists." It's so odd the way chance combinations of words can lead to strange, unexpected search engine hits. I've commented on this twice before. I may as well announce, also, that I've registered the domain "geekofalltrades.net" and pointed it to this blog. So from now on, if you are looking for me, you don't have to remember all that Typepad stuff - just point your browswer to http://www.geekofalltrades.net. That's me, in the tiny red circle toward the bottom right. That mysterious picture is a graph showing the interconnections of a subset of blogs on my bloghost, Typepad. It was created by the keeper of a blog called Data Mining, which looks very compelling even beyond the Typepad graph. I can't say I fully understand what a "graph of the largest connected component of only Typepad blogs" actually is, but if you visit Data Mining's post featuring this graph, you can click on any dot - including the dot I circled above - and find your way to some unexpected corner of the Typepad blogiverse. I discovered Data Mining's excellent Typepad graph in the GOAT logs - evidently someone clicked on my little dot and found his or her way here. I hope that person wasn't too disappointed. An interesting feature of the graph is that blogs with similar subject matter tend to lump together. 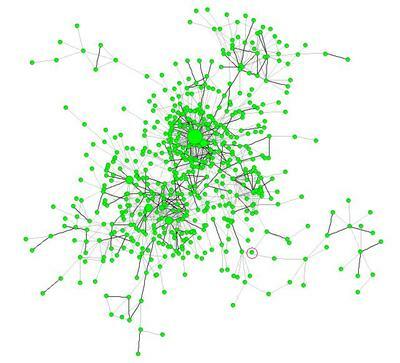 I think this is because the lines on the graph represent interlinks between blogs, and blogs tend to link to other blogs having similar subject matter. I actually found my blog nestled in a section of the graph that contains mostly law blogs - I think that is due to a couple of trackback links I have to Patently-O that seem to direct one or two readers a day to my little old GOAT.